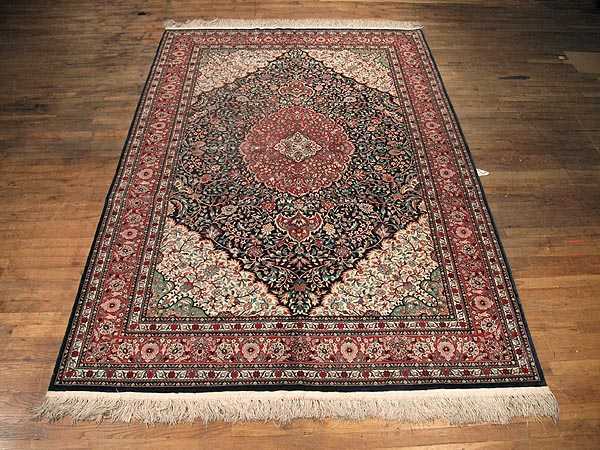 "The handmade rug in the picture has a medallion design and some naturally appealing colors. The background is navy but around it markers of bright colors are painted that are very contrasting. The overall used motifs are mainly floral shaded in green or red colors that appear in the leaves and flowers ornaments with a perfect naturalness. The center of the medallion is worked on ivory and the rest of it on a strong and joyful red color. The inner corners of the Persian rug include two colors, ivory and green completing the natural color scheme of the Persian rug. Scalloped edges framing the medallion are delicately drawn. Ord#6017-14J"